I've got a few, quite silly, non-technical questions about giving codenames to Debian releases. 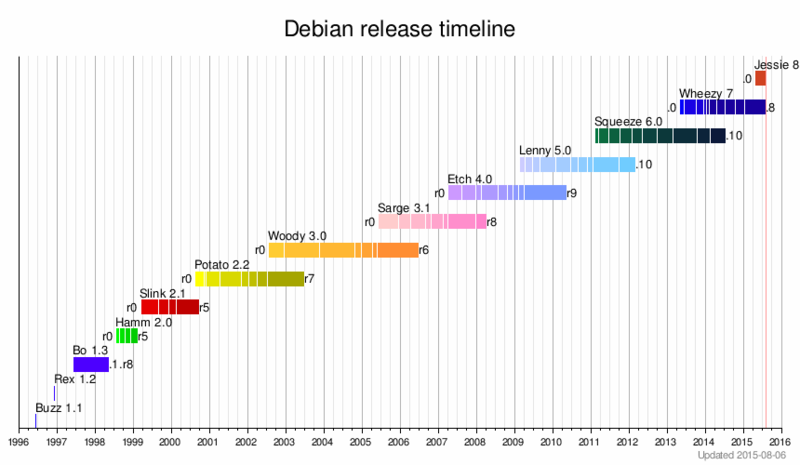 Each Debian release has its unique codename, which is (so far) a characters' name from Toy Story movies by Pixar. release 9.0 is stretch - a purple rubbery octopus toy at Sunnyside Daycare (currently stable). release 12.0 is bookworm - intelligent worm toy with a built-in flashlight. testing which is symbolic link to codename which is currently testing. The list of Toy Story characters is quite robust but at some time, there will be no more characters' names to assign. What codenames will be assigned if we run out of characters' names? Who decides what is codename of next release (please don't answer ambiguously like: 'community')? How many releases' names are planned ahead? The decision of using Toy Story names was made by Bruce Perens who was, at the time, the Debian Project Leader and was working also at Pixar, the company that produced the movies. Infographics by Claudio Ferreira Filho (@filhocf) (license: CC BY-SA 4.0). As pointed out by eyoung100, Stretch is the octopus in Toy Story 3, and Buster is Andy's dog. As you mention in your updated question, Bullseye is Woody's horse. Bookworm is the intelligent, flashlight-wielding worm toy from Toy Story 3. Also, Sid is the name of the next-door kid who breaks all his toys. "Still in development" is a backronym. It has been 19 years since the first codenamed release (Buzz 1996). So far 13 character names are used. Toy Story has 40ish potential names, assuming no more movies. 13/19=0.68 names used per year. Thus to use 40 names it will take, 40/0.68 = 59 years. Which will bring us to 1996+59=2055. If we assume that Moore's law continues, (which to be fair, seems unlikely) then the number of transistors per CPU by the time Debian runs out of names will be 2^(59/2) = 759,250,125 times that it was when Debian began using this naming scheme. Or 1,048,576 times that of today. This will be a very different world in computing. Today a high end CPU has 4 billion transistors (like a Xeon), and a super computer might have 10,000 of them (like Tianhe-2), so the supercomputer has 40,000,000,000,000 transistors. An iPhone 6 CPU has 2,000,000,000 transistors. The smartphones of 2055, when Debian runs out of names will have 25x as many transistors as today's best supercomputers. 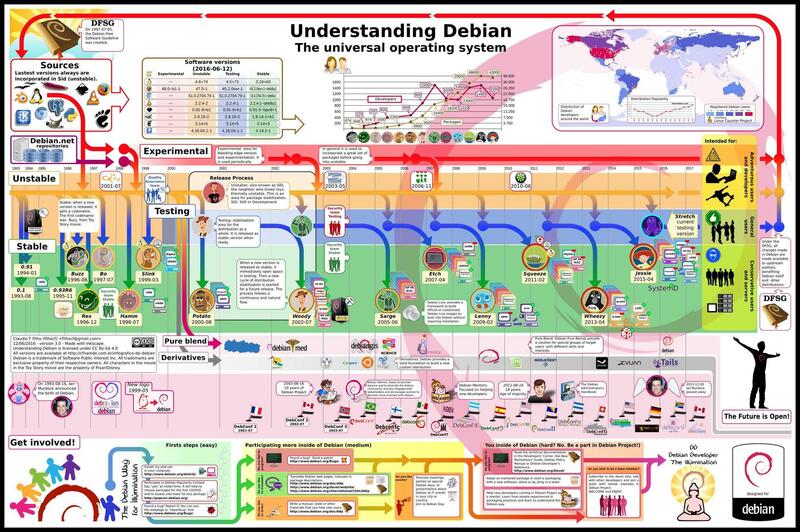 It is hard to say if Debian will still be a functional OS for such computers. It does however seem highly unlikely that Moore's law will continue up to that point. In which case, computing will likely go somewhere far weirder. Quantum, optical, or other technologies which haven't been conceived of. In short, Debian does not have to worry about running out of names. The computing world is likely to be so different by the time it does, that such worries make no sense. Counting from Toy Story to Toy Story 4 (planned to be release 2017), there are less than 8 years between movies, on average. Using @Oxinabox's estimate of less than a release per year, that would require less than 8 new characters per movie (in fact, 22 years/3 movies*0.68 debian releases/year=about 5 new characters per movie), to keep going forever. I imagine, in practice, if they were to run out (or before), they'd select a new movie franchise. Not the answer you're looking for? Browse other questions tagged debian distributions or ask your own question. What will Debian releases be called after they run out of Toy Story characters? What is the differences between distributions, the OS and code names (stable, testing) in linux and what order is that listed in /etc/*release? Is Ubuntu 12.04 likely to be more stable compared to Debian testing? On Debian Testing: How to get a recent Iceweasel Release (non-ESR) version without updating to Unstable? Kernel Backport for Debian Jessie? Where can I download debian-test.iso? Will my debian testing become stable version, after new stable version released?